By the 1930s, the principles of reducing aerodynamic drag – or streamlining, as it was then known – were well-established. The design of airships – huge, underpowered craft that needed as low a drag as possible – had resulted in many thousands of hours of wind tunnel testing of different shapes. The testing was successful – a good airship of the 1930s had drag that was just 3 per cent of a circular plate of the same frontal area. But what of cars? The vast majority of cars had no attention at all paid to reducing aero drag. 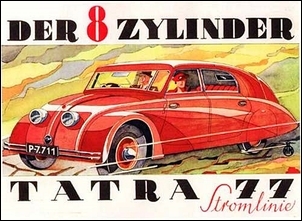 …and the Tatra T77 of 1934 – a true production model. 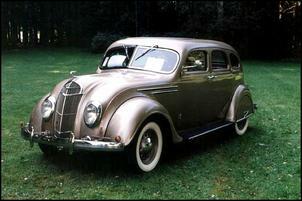 Instead, a typical 1930s car looked like this Ford. Streamlining was confined only to styling touches – the teardrop headlights and sweeping fenders. The windscreen was still upright, and at the back of the car (where the greatest attention needs to be paid to drag reduction), the curved rear edges and vertical surfaces created enormous wake and vortices. Even the 1934 Chrysler Airflow was really only a half-hearted attempt at reducing aero drag. 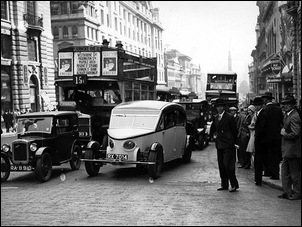 Looking with dismay at what mainstream car manufacturers were doing, several inventors in the 1930s were prompted to go their own way. The results were some simply extraordinary cars. Shown to the public in late 1930, the Burney Streamliner was the work of Sir C Dennistoun Burney, an Englishman. Burney had been managing director of the company that built the R100 airship, so he well knew the advantages of streamlining. Furthermore, after the disastrous loss of the competitor R101 airship, the writing was on the wall for the continuation of a British airship program. The R100 airship, although successful in its trials, was scrapped – and Burney went on to set up a company called Streamline Cars Ltd. Including the prototype, thirteen Burney Streamliners were built, with each car being slightly different. Work began with a front-wheel 12/75hp Alvis chassis turned back to front, so placing the engine at the extreme rear of the car. 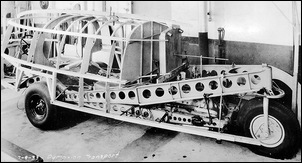 The chassis was braced by cross beams and tensioned strainers, aircraft style. 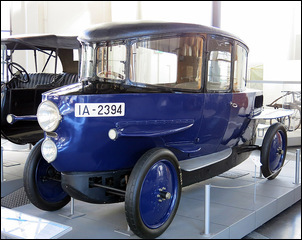 Suspension both front and rear was independent, with front suspension using a single transverse leaf spring and the rear suspension using two transverse leafs. A full length undertray was fitted. At just under 20 feet, the cars were very long. However, the 50-degree steering lock of the front wheels allowed the car to have a turning circle of only 39 feet. To accommodate such large steering angles, the front cycle guards turned with the wheels. Front track was 5 feet, with rear track a narrower 4 feet 8 inches (some references suggest the rear track was even smaller than this). Wheelbase was 12 feet 5 inches and ground clearance was 9.5 inches. Interior room was enormous, with seating for seven people. The engine was a straight-eight twin-cam of 3 litres, supplied by an external company called Beverley-Barnes. The engine was liquid cooled by twin radiators, one mounted each side and force-fed air via fans drawing from the side scoops. Drive was to the rear wheels through a four-speed gearbox. Under the short nose sat two batteries and a 14 gallon fuel tank. The Burney Streamliner had a claimed cruising speed of 70 mph and an asking price of £1500 – then a similar cost to a luxury car like an eight-cylinder Lincoln. Rolls Royce expressed interest in the Streamliner and the company’s engineers were impressed when they drove it – especially by the low cabin noise and good ride quality. However, nothing came of this. A car fitted with a 4.4 litre Lycoming six cylinder engine was taken to the US, but again (despite it being suggested that GM was a potential suitor), no major company interest occurred. In 1934, the rights for production were bought by Crossley. They called the resulting vehicle a Crossley-Burney and powered it with a 2 litre engine. Unfortunately, they also placed a traditional 1930s front on the car, which made it look even stranger than it had previously. Only 25 of these cars were built. 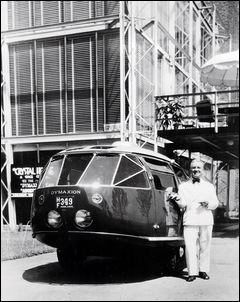 The Dymaxion car was the brainchild of United States inventor, futurist and mathematician Buckminster Fuller. Despite now being highly regarded as the inventor of the geodesic architectural dome, at the time of the Dymaxion car, Fuller was thought of as being a bit nuts. In 1928 he had invented a house that was circular in shape, and was suspended from a tall, internal vertical mast. (In fact, some called it ‘the house on a pole’.) The mast also served as the distributive mechanism for air, light and heat. The walls were made of thin aluminium sheet, and the house was designed to have a waterless packaging toilet and rely on solar energy for power. An integrated wind-deflector ventilator was placed on top. The house was way ahead of its time – so far ahead, that some of its technologies had not yet been invented. At this stage in his life, Fuller had taken a vow of near-silence, so much communication about his house design had to occur through written letters. 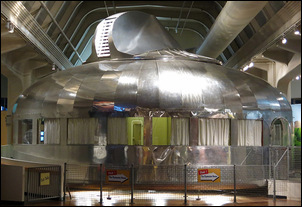 Not surprisingly, no Dymaxion house was ever constructed according to Fuller’s plans, although in the late 1940s a hybridised version was constructed from prototype parts. This is the house shown here, now on display at the Henry Ford museum in Detroit. 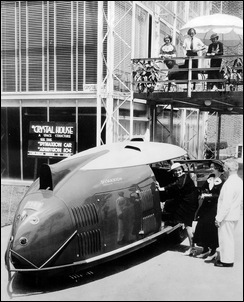 When the Dymaxion house was being designed, Fuller had decided that an equally advanced car was needed to go with it. This he envisaged as a jet-propelled, streamlined transport with inflatable collapsible wings that could travel by road, sea or air. 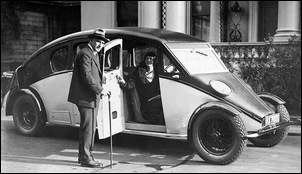 He returned to the design of the vehicle in 1933, deciding to start with a land vehicle powered by a conventional motor. Fuller hired yatch designer, aviation pioneer and naval architect Starling Burgess to supervise the car construction – Burgess also contributed substantially to its design. Buckminster Fuller liked working with Burgess because he understood Fuller’s “intuitive design” approach. Of the two, Burgess was the designer with the most credibility and experience, having taken out the 1915 Collier Trophy for advances in aviation. Three quite different cars were built and so descriptions of the cars need to be general. A chrome-moly steel chassis, drilled for lightness, was used with wooden body framing and an aluminium skin. At 19 feet long, the Dymaxion was similar in length to the Burnie Streamliner – but the positions of the various components within that length were quite different. The Dymaxion also used three wheels, compared to the conventional four used on the Burnie. A contemporary Ford V8 was used, placed ahead of the rear axle line (and so within the wheelbase) and driving the front wheels. About one-third of the car’s length was in front of the front axle line; the rear overhang was minimal. The car had a mass of 1045kg. A single rear wheel was fitted – this steered at angles of up to 90 degrees, allowing the car to turn in its own length. At least the first Dymaxion had double frames, hinged together. One frame connected the three wheels and was unsprung. The other frame supported the driveline and bodywork and was sprung. Another Dymaxion appears to have a perimeter frame of more conventional design, with the rear wheel suspended by an inclined training arm. When the car was first shown to the public it caused a sensation. 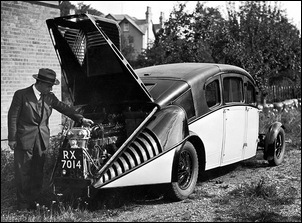 Fuller was invited to display the car at the 1934 New York Auto Show but Chrysler heard of these plans and felt the Dymaxion might make their Airflow (also to be exhibited at the show) look underdone. The invitation was withdrawn but Fuller simply parked the Dymaxion outside the main show entrance, where it attracted huge crowds. Fuller had intended building only one car but the personnel of the small company he had formed pleaded with him to continue. Cars two and three were produced, with Dymaxion 3 driven from Detroit to Chicago in record time. Unfortunately, one of the Dymaxions was involved in a crash, killing the driver. Initial press reports suggested the Dymaxion was to blame, but when the accident was investigated thoroughly, it was found that the Dymaxion had been clipped by another car it was street racing(!). Burney and Fuller were not alone: other stunning 1930s aero specials were produced by men like William Stout, John Tjaarda and the car pictured here from Andre Dubonnet. It’s easy to laugh at these cars, but in some ways they do show the sort of car that was to appear over the next 25 years. There are elements of the Volkswagen Kombi in the ‘cab-forward’ shape of the Dymaxion, and it’s not at all hard to see a scaled-up (still many years away) Volkswagen Beetle in the Burney. The basic Dymaxion shape has probably the lowest aero drag for its internal volume of any car produced - but admittedly its single-wheel rear steering is difficult to defend. Anyway – they’re fascinating cars in any context.